For small groups, starting a meeting via your browser is a great option. Upon clicking Start Browser Meeting, you’ll be redirected to the live transcript view. You’ll know your meeting is in progress when you see the “LIVE” text, timer, and End Meeting button. 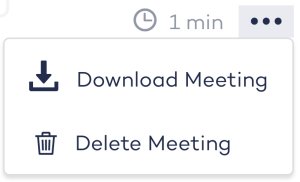 When your meeting is complete you must click the End Meeting button, otherwise your meeting will continue running, and will be labeled as “in progress” in your “My Meetings” section. To edit your transcript and/or meeting summary, simply locate the meeting from the dashboard or “My Meetings” section and click to open it. By default, this view will show your meeting details across the top, the full transcript on the left, and your summary on the right. You can choose to only view one at a time by clicking the Page Layout toggles in the bottom right corner.